Camus launched Extra Elegance 15 years ago - an ambitious Cognac in a contemporary packaging that broke all the rules at the time. Today the house is going a step further with the release of a new Extra expression called Dark and Intense. When first launched in 2000, Extra shattered traditional codes by presenting the Cognac in the purest of forms. From then on, the ultimate transparency of the clean-cut decanter design was all that was needed to pay due tribute to the exceptional blend it contained. Extra is this year revealing its darker side with Extra Dark & Intense. “First of all, we made a selection of the most appropriate eaux-de-vie. Then we decanted them from the 340-liter casks in which they had been ageing, so that the casks could be reopened in order to regenerate their full aromatic potential, by carefully toasting them over the naked flames at a controlled temperature. This delicate and meticulous operation is performed by hand, barrel by barrel, relying on the master cooper’s expertise to determine the length of time and extent of toasting needed to obtain the best harmony between the Cognac and the oak. The casks are then refilled with the same Cognac and the blend will slowly begin to intensify its spicy aromas. Only by tasting it daily, can we decide when the Cognac has fully taken on its singular character and this finishing phase can end,” says Léger. Each cask of Extra Dark & Intense is identified by a special golden bung, recalling the bright flames that gave it new life. Dark and intense like the Cognac inside it, the decanter has the appearance of a black lacquered monolith, crowned with a gold-coloured neck and cap, recalling the flames from the toasting process. This new expression, being unveiled today, is more aromatic and intense - but just as distinguished and pure - as Extra, so it could be only be named Extra Dark & Intense. 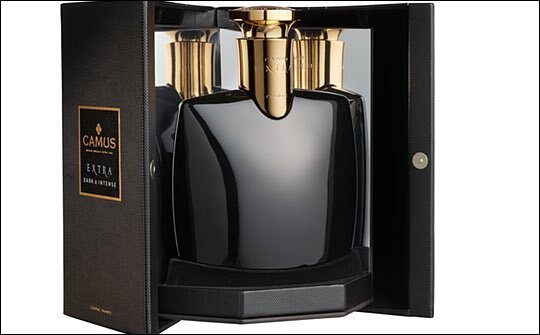 Camus Extra Dark & Intense 70cl: US$480 (duty-free RRP). The new Cognac’s official launch will be at the TFWA-Asia Pacific Exhibition, 10-14 May in Singapore: Booth #J8.